Water dip decals are colorful cartoonish icons of vintage vacations. They decorated luggage and car windows, commemorating many a family vacation at Niagara Falls, a visit to a buffalo ranch, or Disneyland. Hobbyists have for generations used decals on car and airplane models. Flanked by a couple of pink fish, this colorful unused decal is likely a souvenir of a weekend at The Lake. 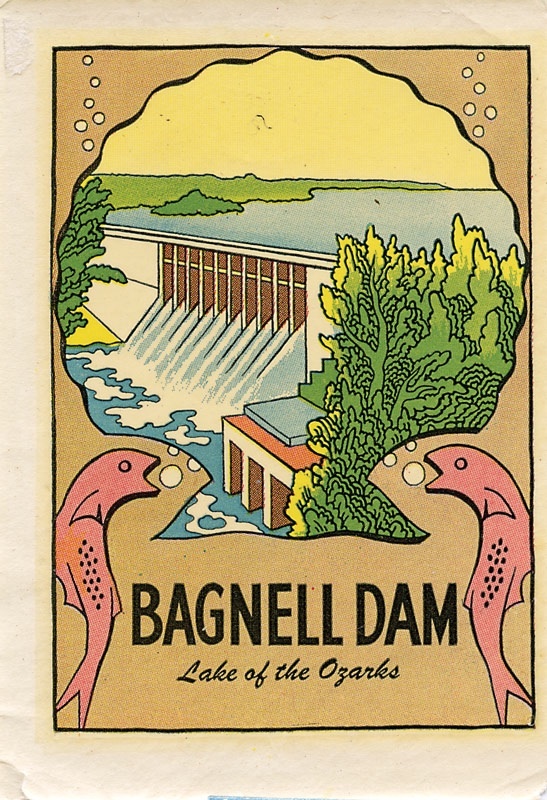 Popular imagery of Bagnell Dam rivaled pictorial representations of Boulder/Hoover Dam in both variety and abundance.